Out of the box, Rock Band provides you with everything you need to create your own virtual rock band in the comfort of your own living room. When the first game in the series was released in 2008 it represented the evolution of the rhythm genre, the first game ever to allow you to perform music from the world’s biggest rock artists with your friends using drum, bass/lead guitar and microphone peripherals. 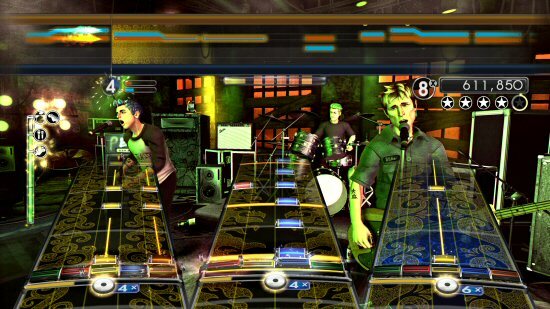 Green Day: Rock Band is the second title in the series to focus solely on one artist, so comparisons to the brilliant The Beatles: Rock Band are inevitable. Had we not already seen how well a Rock Band game can work with a solo artist and how impressively Harmonix structured career mode inThe Beatles game to reflect the Fab Four's career and vibe, then pehaps we'd be talking about Green Day: Rock Band differently. But with memories of The Beatles game floating around the back of our minds, this latest addition to the series disappoints. Green Day: Rock Band has a strong track-list that includes 47 songs from three of the American Trio's greatest albums: Dookie, American Idiot and 21st Century Breakdown (12 out of 18 tracks,) but it lacks the narrative drive of the Fab Four's psychedelic journey and ultimately fails to present the career of the band, which spans over 20 years, in a way that engages you.